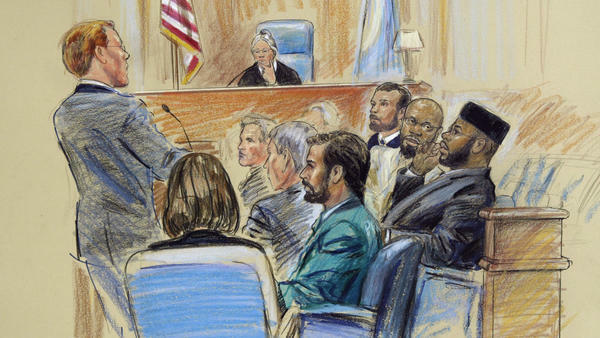 Seifullah Chapman — seen here third from right, in a court sketch from a hearing in 2004 — should be freed on supervised release, a federal judge has ruled. District Judge Leonie M. Brinkema in eastern Virginia ordered Chapman, a former U.S. Marine, to be freed immediately and to serve three years of supervised release. The move dramatically shortens the 65-year prison term he had been serving. On Friday, the judge also rejected federal prosecutors' request for a stay on the release order. Their request said the government has a strong chance of winning an appeal and that Chapman poses a flight risk and a danger to the public. Brinkema denied the motion in a brief notice, saying her reasons had been explained in a phone conference with both legal teams. Chapman, 45, had been found guilty of several crimes, from conspiracy to support a terrorist group to conspiracy to use firearms in connection with a violent crime. The reversal stems from the Supreme Court's ruling in the Dimaya immigration case in April, when high court justices said the government's legal definition of "violent crime" was too vague and could lead to arbitrary enforcement. Chapman had filed a motion to vacate his sentence in 2016, citing a similar case. Brinkema issued the order to free Chapman some 14 years after she found him guilty in a 2004 bench trial. After initially imposing an 85-year sentence, Brinkema cut Chapman's term by 20 years at a resentencing hearing in 2005. When Chapman was convicted, Brinkema said, two of the most serious charges against him — supporting a terrorist group and violating the Neutrality Act — were categorized as crimes of violence. The designation raises an offense to the level of a felony and can boost the minimum sentences at stake. But the "violent crime" classification changed in light of the Supreme Court's ruling this past spring. And on Thursday, Brinkema said the current interpretation gives more leeway in viewing the case against Chapman. Brinkema wrote that the government had never shown Chapman "traveled to the front lines or any area of active combat, discharged a firearm in any context other than target practice, or otherwise used force" against anyone. Vacating the three convictions for which Chapman still owed prison time, the judge recounted the background of the case: that Chapman and other Muslims he had met at a center in Falls Church, Va., had decided in 2000 to form a paintball group to "prepare for physical jihad" — possibly to fight for Muslim causes in Chechnya. Through that involvement, Chapman traveled to Pakistan and trained with the Laskhar-e-Taiba militant group, which was hoping to attack Indian interests in Kashmir. Chapman returned to the U.S. after the Sept. 11, 2001, terrorist attacks. But he maintained contact with some of the people he had met in Pakistan, and he hosted an LET leader in a visit to Virginia. He also got a video module to put on a drone for that leader, and he sold a gun to a co-conspirator, the government said. Chapman and other members of the "paintball jihad" group were arrested in the summer of 2003. He has insisted that he doesn't pose a threat to the U.S., reportedly saying at his 2005 resentencing hearing, "I have never been a terrorist, I am not now a terrorist, and I will never in the future be a terrorist. I totally reject this label." Chapman is currently being held at the high security U.S. penitentiary in Terre Haute, Ind., according to federal records. In addition to its standard facilities, the prison has also housed a "Communications Management Unit" — a special section within the prison that was referred to as "Guantanamo North" in a 2011 NPR investigative report. At the time of that report, NPR found that most of the CMU's inmates were Muslim and two-thirds of them were U.S. citizens.